Because I only flew your Airlines twice I don't know if you would take my words seriously, but on the second thought I felt you would appreciate my concerns because I am a Bhutanese who flew only twice and already has something to share. I have been at the airport over seven times waiting for my sister and for the seven times I wished we had some shelter indoor to take refuge, especially during the cold winter days. Is it not possible to create an indoor space for the people (not the passengers) to wait and eat during the long waiting hours and also during the long delayed departures? It can be a good business as well. Then during such waiting times, we look at the LCD screens outside for information but the information displayed there are technically short to understand. My sister comes from Bangkok but the screen shows flights from Dhaka and Nepal. Even with the huge screen hanging we have to resort to asking people nearby to know that the flight from Bangkok is the one coming from Dhaka. In big airports they have too many flights info to display therefore they keep it brief but in Paro the big screen as only two or three lines to show and I suggest if you could consider giving clearer information about the flights. Like KB-217- From BKK, Via Dhaka etc. I don't mind not having tissue paper to over the toilet pot, as long as there is tissue to wipe because I have used dirtier toilets but there are many people travelling some of whom might be very particular. I saw that the chambers in the tiny in-flight lavatory where soap and toilet pot wrapper are kept were empty when I was flying from Paro. Surprisingly they were filled up when I returned. I assumed that you all assume your Bhutanese passengers flying from Paro don't require too much luxury. There is a need to pay attention to the conditions of the seats. The colors have changed and some are shining with dirt. Armrest from the front seat falls directly on to the knee of the passenger on the back seat, and I am sure this is not supposed to happen. This aircraft I travelled in was too new to see such fate. It is not everyday that our country can buy aircraft therefore stitch in time might save nine. And finally I had big concern with the departure time from Bangkok. Bangkok is the gateway to Bhutan for people from whole world and their very first travelling experience to Bhutan should not be a sleepless night of waiting and rushing to the airport at dark hours of the morning. Even for Bhutanese travelers returning home, after having enjoyed the whole trip in city the ordeal of early hour flight is like that flashlight in Men In Black that erases all the memories. Please make that flight an enjoyable experience instead of having everybody sleeping on board due to the sleepless night. So many comments from a man who has traveled only twice might irritate you but let me humbly submit that twice was enough for a man who observes with concern. Update 23rd Aug: Is it only me who thought Drukair and Civil Aviation are the same thing? Thanks to friends on Twitter for letting me know that they are two separate bodies. Now I know that when I talk about airport services I should be addressing it to civil aviation. 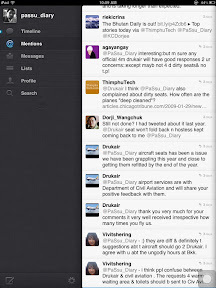 And I very happy that Druk Air responded positively on twitter. I find your comments valid and hope that someone in drukair management get to read your feelings. and with regard to having a proper waiting room and more informative information display board, i think it should be addressed to Department of Civil Aviation. nevertheless, I commend you for all your thoughts. When I landed at Paro Airport Via BKK, I remember seeing my father all worn out and tired of standing in front of the passenger's main Exit. Since this waiting view in Paro was a usual view, I didn't really noticed the need of waiting area until now. I really hope someone from Airport service sees your post and act on it.